We hope you enjoy the power point presentation below! 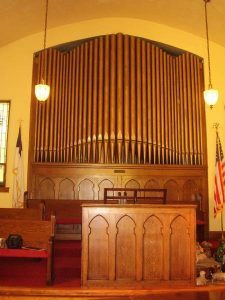 HISTORY: The organ in the church was installed when the building served the congregation of the Evangelical United Brethren. 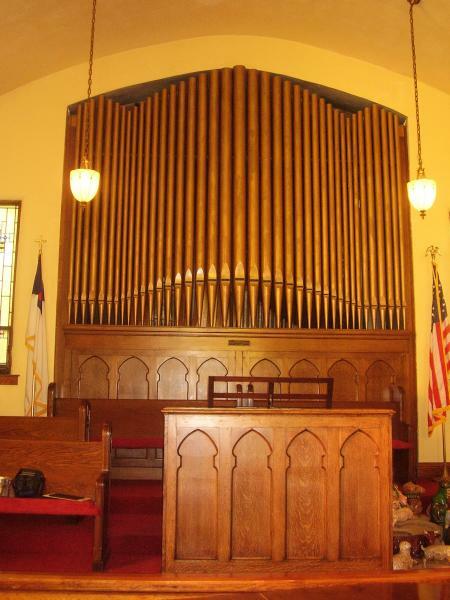 At the time, the manufacturer was located in Trenton, Illinois, and they had just installed their Opus 2 in Trinity Episcopal in nearby Mattoon. 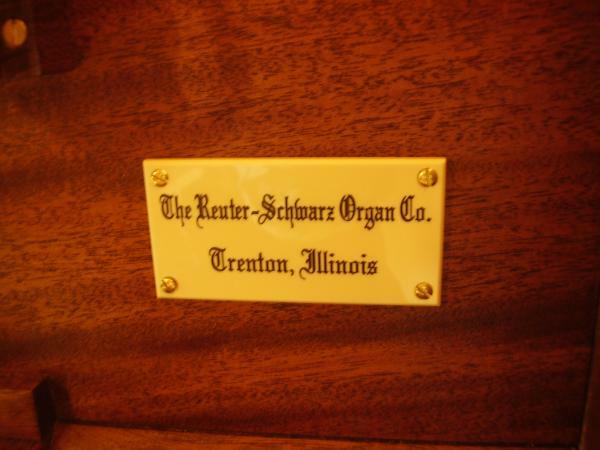 (The nameplate from the Mattoon organ was replicated for this project.) 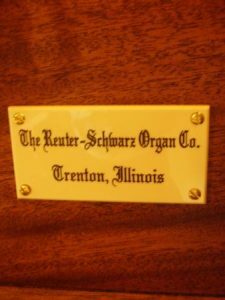 Subsequently, the firm relocated to Lawrence, Kansas and changed their name to the Reuter Organ Company. 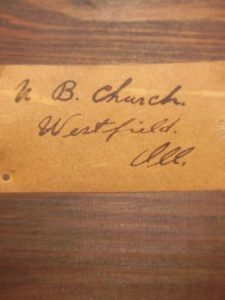 The organ in Westfield retains all 639 of its original pipes (244 played from the bottom keyboard, 362 played from the top keyboard, and 30 played by the Pedals), as well as the 19 additional pipes that were added to the Pedal division when the console was rebuilt c.1960. 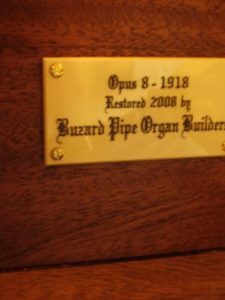 DOCUMENTATION: When the original console was rebuilt in 1960 the builder’s nameplate was removed, so the organ’s manufacturer was initially a matter of conjecture. 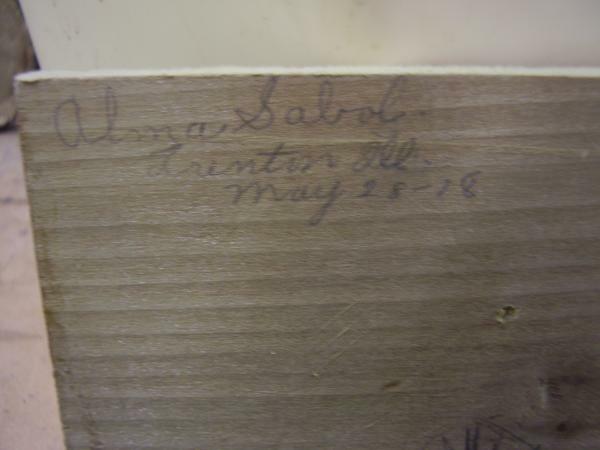 During restoration of the Pedal wind chest we found the penciled inscription “Alma Sabol, Trenton, Ill May 28, ’18,” This provided the link we needed to identify Reuter-Schwarz as the builder, which was confirmed by an inspection of their Opus list which shows this organ for the E.U.B. congregation. It wouldn’t be the first time that women were working in the factory while men were off winning the “Great War!” (Better organs than bombs, however.) 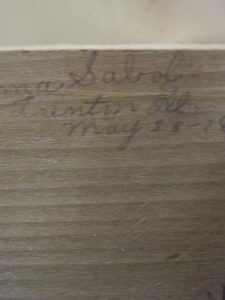 The Reuter Opus list gives the year as 1919, but it seems unlikely that it would have taken another eight months from May to complete this instrument, and the date of 1918 is what is given in the church’s records. The organ uses electropneumatic action (wind under pressure is used to do work in addition to the wind that passes through the pipes to make them sound). The action operates at about 8” wind pressure and the pipes speak at about 4” wind pressure. 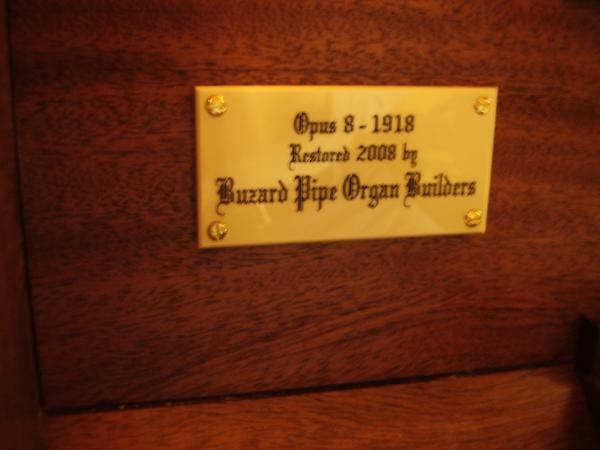 In the 2008 restoration, all pipes were cleaned, stoppers repacked, and slide tuners installed where necessary. The original pitch of the instrument, c.A-435 Hz, has been retained. 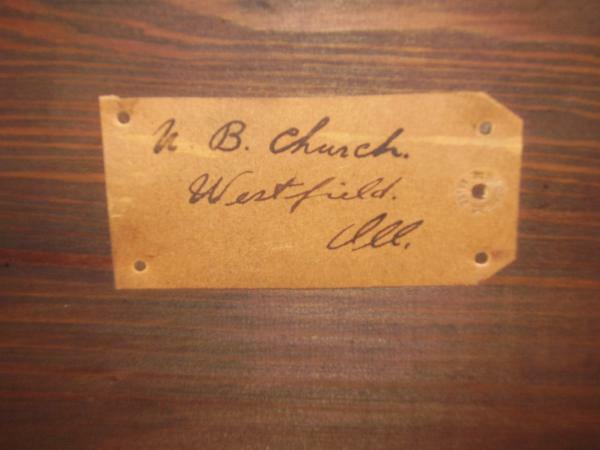 Windchests, reservoir, tremolo, and expression engine were completely and carefully restored. The console was completely rebuilt with new manual keyboards and nameboard, and a solid state relay and combination action was installed. The casework was cleaned and the façade pipes repainted (34 of the 39 visible pipes speak; the remaining 4 are “dummies.”) The organ once again plays and sounds as good as it did when it was new, ready for its second century of faithful service. Member of the Buzard staff who worked on this project included: David Brown, John-Paul Buzard, Brian Davis, Steven Downes, John Jordan, Stuart Weber, John Wiegand, and Keith Williams.